With a Preface by Alabama Football Coach Nick Saban and a Foreword by ESPN's College Gameday Host Rece Davis. In 2017, Alabama won its fifth national title during Coach Nick Saban's tenure. This is Saban's sixth national title win as a coach. He's now tied with Bear Bryant for coach with the most national championships. Through those years of observation, now comes his 360-degree perspective on Alabama football and Coach Nick Saban’s unique coaching style, a style that has led the Crimson Tide to five Southeastern Conference titles, three consecutive College Football Playoff appearances and five national championships. Between 2008 and 2016, University of Alabama's Nick Saban one of college football's winningest coaches led his team to four national championships. This "textbook on Saban's way of doing business at Alabama" when recruiting, for example, he looks for players with the "bubble," a large rear end that allows for more powerful tackling and blocking focuses on Alabama's evolution from a team that had had four coaches in five years before Saban arrived. Savage practically canonizes Saban. Savage was general manager of the NFL's Cleveland Browns when Saban was that team's defensive coordinator and is now an analyst for the Crimson Tide Radio Network, working with Saban on a regular basis and emailing the coach scouting reports on upcoming opponents (a role Savage mentions repeatedly). Savage, writing with Glier (How the SEC Became Goliath), tells the story from an insider's perspective, including details on the recruiting process, skills development, practice sessions, and notable coaching decisions including the living room chats where Saban encourages prospects to "make a 40-year decision, not a four-year decision," to the backstory of the Tide's famous onside kick against Clemson in the 2015 National Championship Game. 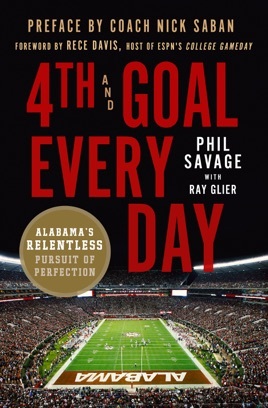 Although loaded with roster lists and stats that Alabaman fans will devour, the book at times veers toward a catalogue of Savage's own accomplishments.